From Louis and Clarke to the great ol' California Gold Rush, America has had the great fortune of experiencing a plethora of awesome triumphs of the human spirit. Just gazing upon good Old Glory, one could just feel the patriotism, hard work and sacrifice that early Americans experienced in order to lay the foundation for their future children and for a Nation that will forever been known as the "Land of Opportunity." The American Trail tells the story of these brave men and women. This thirteen part serial chronicles the beautiful history of the United States of America and tells of the lives that made the citizens of that great Nation look up at that Red, White, and Blue and say "You're a grand old flag, You're a high flying flag/ And forever in peace may you wave." ("You're a Grand Old Flag" by George M. Cohan). For more western historical-based drama, see also Encore Theater, Frontier Gentleman, Frontier Town, Six Shooter, Gunsmoke, and Have Gun Will Travel. For more American historical drama, see also: American Adventure, An American in England, Cavalcade of America, Democracy in America, Destination Freedom, Frontier Fighters, Norman Corwin Collection, Mr President, Science Magazine of the Air, You Are There, and The American History Collection. 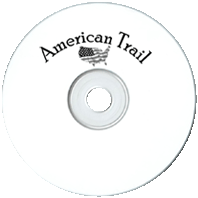 Be the first to comment on "American Trail"